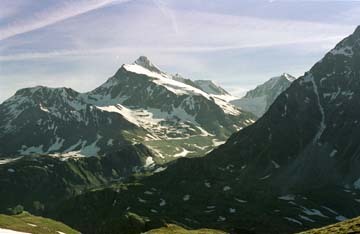 This tour took place in July 1999, after a spectacularly bad winter & meets up with the Monte Rosa Rundtour of 1975. 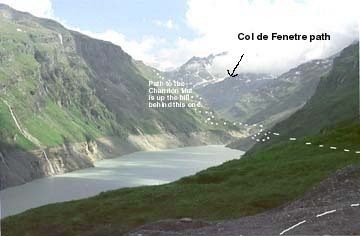 A helpful guide is Chris Wright's 'The Grand Tour of Monte Rosa Vol 1' but see my caveat on the Col de Valcournera. The narrative below is my usual mixture of recollection & guide-book-style stuff. Maps: Stage 1 & 2, LK 283 Arolla. 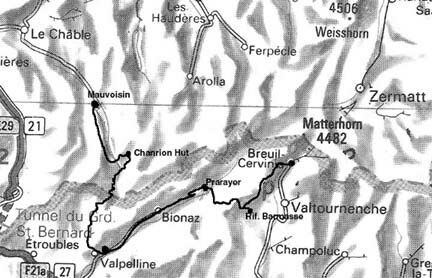 Stages 2-5, LK 293 Valpelline. Stages 5 & 6 LK 293 Valpelline & LK 283 Arolla. This was in 1999. The timetable is likely to have changed but the Swiss train timetables are on this link in English. I had a late lunch of Assiette Bagneoise in the simple Hotel Mauvoisin (about 1900m) to fuel the walk up to the Swiss Alpine Club's Chanrion Hut (2462m). There are zig-zags from the hotel up to the dam, where one enters a horrible wet tunnel with occasional windows looking out over the lake, which was about 2/3 full at this time, leaving an ugly scar above the water. The tunnel goes on for about half a kilometre. It seems a long walk along the lake & there is about 200 metres of wasted up but I did see a lot of marmots. Then, one takes the path left & follow the signs for the hut, as the route is a little different from the LK50 & shorter. (You go through Le Lancet). It is 480 metres up to the hut & it took me 3.5 hours altogether. The guardian & his assistant are very friendly, not always the case in huts. This was as well, as the rest were unfriendly Parisians. From the Hotel Mauvoisin. The dam & the path up. Lac du Mauvoisin. 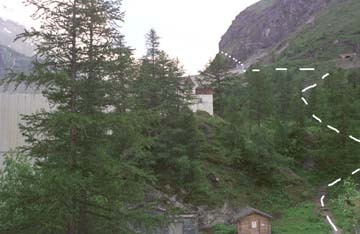 The path goes up behind the ridge on the left. 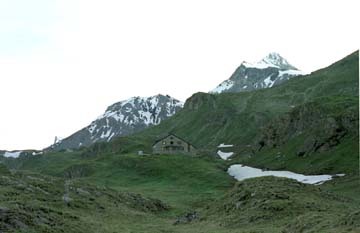 The Chanrion Hut with La Ruinette (the mountain) behind. Last revised 27/6/2008 © 1998-2008 Ken Baldry. All rights reserved.